Do the Mets Have a Plan? The odds are excellent that last night's Nets game was watched by more people than any other Nets game will be this season. The Nets will never be as must-see as they were last night. 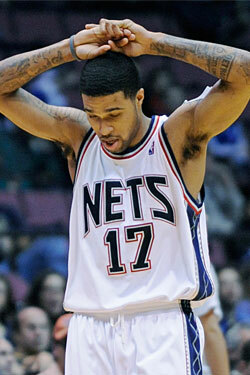 The world had to see: Were the Nets really this bad? Will they really break the record for most losses to start a season? Could it actually implode like this? It can. Oh, how it can. The Nets lost to the Dallas Mavericks 117–101, highlighted by a slasher-flick second quarter in which they gave up 49 points on seventeen-of-nineteen shooting. That secured the 0–18 start that will assure their place in the annals of painful things. "There aren't really any words I can use to describe it," Devin Harris said. "You want to make history, but not in this way." Amusingly, general manager Kiki Vandeweghe is taking over as coach today; he had waited a couple of days for new assistant coach Del Harris to make it into town. (We can't imagine he was in much of a hurry.) In his next ten games, Vandeweghe has, we'd say, three solid chances to end the streak. Tomorrow night at the Izod Center against Charlotte, next Wednesday at home against Golden State, and a noon tilt this Sunday at the Garden against the Knicks. Please don't let the Knicks be the team that snaps the Nets' losing streak. Please.